Hit and Miss | 2P START! I sincerly enjoyed this comic. I love Duck Hunting, and utterly wish you could shoot that damn dog! By the by, Ray picked this over a Brawl idea? Astonishing. But not in the “that comic would have been better than this one” way, it’s just in the “Ray the Brawl fanatic passes on a Brawl comic?” way. Great comic guys! At first I was like, “Wait!…He’s not green and black like the box!” Then I saw the white paint bucket. Nice touch. You can even see a tiny hint of the colors seperating at the neck. Yeah, I’m fairly certain that was the subtle detail. I saw the paint can and figured the duck was painted but I couldn’t tell if the seperation at the neck was just my dirty screen or not. Why isn’t there a Duck Hunt 2: Clay Pigeon Boogaloo for the Wii? I mean, the Wiimote is basically a space age Light Gun. Throw some modern graphics on it, and some waggling and you’d have at LEAST a $30 game that’d probably be a million seller. Nice comic guys! Loved the idea this week. Duck Hunt is one of my favorite games of all time. I like the logo, too. One detail I’m trying to figure out: What game is being played on the DS? I’m thinking it may be some art from Animal Crossing: Wild World with two characters standing on top of the world talking to eachother, but I’m not sure. I love the shadow of dog in the last panel. Oh wow I had to tilt my screen to see that. Nice catch. while Mario is swimming in money. I think the dog is the one who chose who his voice actor should be. I agree with all the other comments above, but te part that i thot was funny was how the DS Lite was printing all the cash..probley from scriblenauts. Great Comic Guys! I loved the joke and the amount of detail this week. Not sure what Aflac is, but luckily I don’t need to know that to get the joke. The reason Duck Hunt never got a sequel is because PETA would be all over that nowadays. Even in Wii Play you’re mostly shooting inanimate objects. Aflac is a popular car insurance company in America (I assume you’re probably based elsewhere). The acronym for their name (forget what is is exactly) sounds sort of like “quack quack”, like a duck, and their mascot grew out of that. Wiki article here. And great preview thingy Tim, it’s almost perfect (no smilies preview) but it’s good enough. DON’T CHANGE IT ANYMORE!! WE LIKE OUR PREVIEWS!! Great comic. Love all the little things. Doesn’t that spell AFLICC, though? Great comic guys I like how the DSi is dispensing money, or are they in Tim’s pool of money? Hey Tim, how did you get Miyamoto AND Mario over at your house?! That’s so cool! The art in the first panel irritates me a little bit, Ray did you intended to let it look like its been shown on an old telivision set? Not literally, no. I just felt like doing more with it than putting box art on a black background. Wow, because of the angle I was looking at my monitor the first time I saw this, I didn’t even see a shadow in the last panel. I might have missed out on the dog’s cameo if a commenter hadn’t mentioned it. It just goes to show that there’s value in looking through the comments on a comic, especially one as meticulously created as Ray’s. Nice comic, guys! I see it. It’s the paintbucket in the corner. Actually, the duck has it better off than Mario. All the duck has to do is get its head stuck in letter boxes and fall down chinmneys. Mario, on the other hand, has to die. Several times. And neither of them make any money. I’ve also noticed that the DS is spitting money out through its GBA slot. Hey, I see the shadow of the dog in the last panel! Also, is that The New Super Mario Bros. playing in the background of the second panel? Lastly, it looks like Miyamoto has the same mouth as Ryu from the “In A Pickle” comic! NCG! Nice comic guys. Kind of curious what the Brawl idea was but this one was quite funny in its own right. Now for the little stuff. It is Mario on the DS but he looks triumphant and you can see a pink spot that should be Peach. Is it Mario Party DS or Mario and Sonic maybe? Also didn’t notice the dog but did notice the duck’s collar and the painted walls. With those weird shapes did the duck just paint over the ofrest background to make it all white? Also also, just because it seems to be something I always point out, nice logo this week! -What comic is on the June calendar? -Where is Samus while she’s making her Verizon call? -Where’s the dog in the last panel? -Why is the grass grey? Thanks. By the way, I’ve beaten that game, and it certainly got my black doom award. Finally got my laptop “fixed”. It’s actually messed up worse than when i gave it to him. But anyway, reading this was a good way to start the day. Not too complicated or anything, but still funny. Good comic. You don’t want it to have baby laptops? I would have never expected a response like that! Heh, NCG. I saw the thumbnail type thing on the main page, and went into this comic not knowing what to expect. I love how cartoony Miamoto looks, with his huge triangle mouth and his strange looking nose. This was a pretty darn funny comic, but there’s one thing missing. What happened to the dog? Meh. I’m probably the first, but I wasn’t a huge fan. Sorry. The last panel was cute, but how many times do we need to make fun of how much money Nintendo is making? Okay my bad. I kinda misinterpreted the comic. I was thinking that the jokes were separate, but they weren’t. haha. 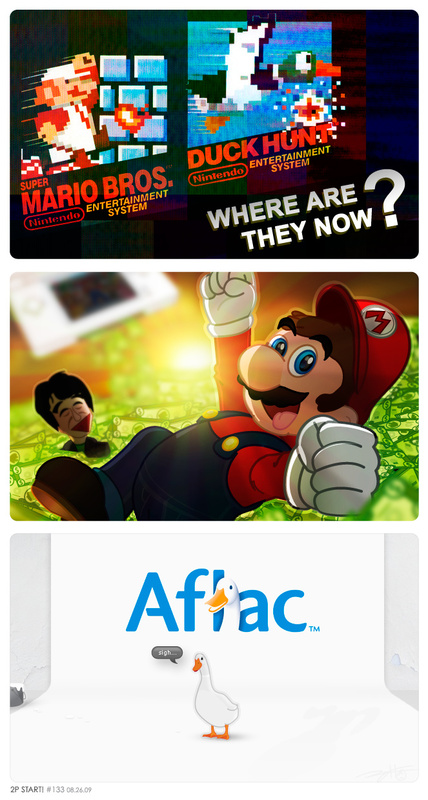 I get it now, Mario’s doing great and the Duck Hunt duck is stuck doing Aflac commercials. OKAY, now it’s a clearer, so it’s funnier, but because I missed the joke the first time, I lost some of the effect. Until it matches the amount of times they’ve made fun of newer Sonic games. Great comic guys and the details in the last panel have a joke of their own!!! What makes this comic really work for me is Miyamoto’s face in panel 2. Nice comic. I thought this was meh. The art was mostly great, but Miyamoto just looks…I don’t know, odd somehow. Give Tom Nook his mouth back. I wonder if it might have been better if it was a “Where are they now?” focusing on a variety of characters instead of just that one game. Like Pauline could be a washed-up star that now has her own reality show, or a guy from the NES Baseball could have since been banned because of steroids (:P). You lose the contrast of Mario’s success vs. the duck’s failure, but it might be balanced out by having a number of smaller jokes (see: Rejected Wii Channels). IDK, just throwing thoughts out there. Kinda understood, not really. I mean, I get that Mario is rich while the duck is doing ads, but I still don’t really get it. Meh, whatever. Good art and stuff, but is the death of 2P START! arriving? j/k, would never think 2P START! is going to die. Long live 2P START! BvrBoy – No offense or anything. We’re cool, right? Right? It took me until about two seconds ago to find the dog. It’s almost the duck’s shadow. It’s to his right on the floor. It’s really hard to see. Finally found the dog. Wouldn’t have found it if it weren’t for the podcast. 50% of 1% FTW! Man, how old is this comic? That’s not even a DSi in the second panel. Because they don’t have GBA slots to spit the money out, silly. I love all the hidden jokes, the DS printing money and Paintcan made me smile. Short but sweet, and overall a good comic. Great comic guys (or just Ray, as it seems). Loved all the hidden jokes, especially the dog. Priceless. Although, I think that you could have done an alternate ending. THE DS! IT PRINTS MONEY! Good comic, never noticed until now that Duck Hunt is kinda… you know, ”dead”.. I blame it on the DOG!!!! Are there cracks in the walls in the last panel? Or are those bullet holes perhaps? Great comic this week. Man, I wish my DS would print money…so I could buy one that would replace my DS Phat. I still can’t see the cover of Duck Hunt without hearing, in my head, that “Clang!” sound my Zapper made with every shot. The duck’s shadow is the dog. Nice stuff. I love the subtle touch of the dog’s shadow on the floor. It gives the *sigh* a much more subtle meaning. Ha! I feel so accomplished i noticed the shadow before reading posts. ( I just didn’t know whose shadow it was.) NIce comic, but not your best. Thanks for all the other great comics! Hey guys, guess I’m rising from my grave.Good comic this week.Been reading and listening to the podcast for a while and decide to finally get in on the action. Just wanted to let to know that 2p start should be in “Awesome the movie”. However… Ray chose something else over a Brawl comic? Who are you and what have you done with Ray?! One or two a year? Nintendo just released two games this week. Granted, one isa compilation of old games, but it’s a darn amazing one at that. It’s also not like this was the only time they’ve released games all year (Wii Sports Resort, Punch-Out!!) and there’s still more to come before next year (M&L 3, NSMBW, Zelda: ST). So as far as that claim goes, all I have to say is…huh? Oh… that dog was more noticeable when I viewed the comic on my iPod Touch earlier this week. I can barely see it now. Neat comic, as usual. Keep it up. We demand it. But I just had to see if anyone else noticed that you can also see the duck’s paint-stained footprints from the paint can to him lol…i had to lower my screen brightness and tilt it to see the dog’s shadow, and I noticed the footprints when i did that. Ohhhh, so the DS prints Mario money, not real money? That explains why Nintendo still has to stay in business. Nice comic! Definitely one of my favorites. I wonder what the exchange rate of Mario money is to some of the other currencies? Hmmmm. Alright… so how much paper and ink in Mario Money is worth a dollar? I blame D3vin, as he showed me the site showing me his second guest comic. I hadn’t really become much of a reader other than D3vin sending me a few comics every now and then for a quick laugh or a pick-me-up when I was blue. After listening to one of your podcasts (another thing D3vin forced down my ear canals) when he got a creepy comment, I decided to give in and read the comic in its entirety, and I surprisingly liked it, even though I can’t say so much about the podcasts… Just not my thing, even though I do find some of the features interesting. 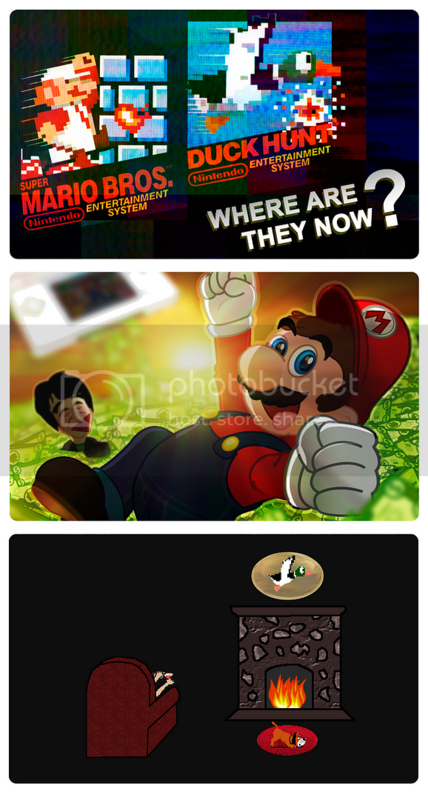 I found this comic interesting enough since I had the Duck Hunt/Super Mario game pak in my Nes, earlier today. Keep up the good work! Geez, man. It sounds like I had you handcuffed to a bed while a Pendulum with a 2P Start comic was on it… I’m glad that you came to your ‘Senses’ and joined. Even though the first is more commonly used, fans still prefer the latter. Better yet, “Is the death of 2P START nearing?”. Oh, and Ray: This comic used to be good. Second appearance of the paint can. Is that flying mario from Super Mario Galaxy? That Miyamoto is made of pure win. The fact the dog’s shadow is in it is what makes this so full of win.